M T D O c t o b e r 2 0 1 8 8 N e w s / V i e w s W hen Hurricane Florence made landfall on Sept. 14, it dropped rain by the foot, unleashed 90 mph winds and churned slowly along the Caro- lina coast. 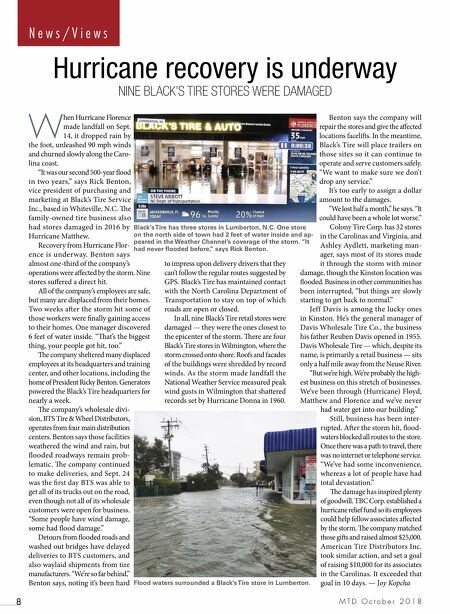 "It was our second 500-year flood in two years," says Rick Benton, vice president of purchasing and marketing at Black's Tire Service Inc., based in Whiteville, N.C. e family-owned tire business also had stores damaged in 2016 by Hurricane Matthew. Recovery from Hurricane Flor- ence is underway. Benton says almost one-third of the company's operations were affected by the storm. Nine stores suffered a direct hit. All of the company's employees are safe, but many are displaced from their homes. Two weeks aer the storm hit some of those workers were finally gaining access to their homes. One manager discovered 6 feet of water inside. "at's the biggest thing, your people got hit, too." e company sheltered many displaced employees at its headquarters and training center, and other locations, including the home of President Ricky Benton. Generators powered the Black's Tire headquarters for nearly a week. e company's wholesale divi- sion, BTS Tire & Wheel Distributors, operates from four main distribution centers. Benton says those facilities weathered the wind and rain, but flooded roadways remain prob- lematic. e company continued to make deliveries, and Sept. 24 was the first day BTS was able to get all of its trucks out on the road, even though not all of its wholesale customers were open for business. "Some people have wind damage, some had flood damage." Detours from flooded roads and washed out bridges have delayed deliveries to BTS customers, and also waylaid shipments from tire manufacturers. "We're so far behind," Benton says, noting it's been hard to impress upon delivery drivers that they can't follow the regular routes suggested by GPS. Black's Tire has maintained contact with the North Carolina Department of Transportation to stay on top of which roads are open or closed. In all, nine Black's Tire retail stores were damaged — they were the ones closest to the epicenter of the storm. ere are four Black's Tire stores in Wilmington, where the storm crossed onto shore. Roofs and facades of the buildings were shredded by record winds. As the storm made landfall the National Weather Service measured peak wind gusts in Wilmington that shattered records set by Hurricane Donna in 1960. Benton says the company will repair the stores and give the affected locations facelis. In the meantime, Black's Tire will place trailers on those sites so it can continue to operate and serve customers safely. "We want to make sure we don't drop any service." It's too early to assign a dollar amount to the damages. "We lost half a month," he says. "It could have been a whole lot worse." Colony Tire Corp. has 32 stores in the Carolinas and Virginia, and Ashley Aydlett, marketing man- ager, says most of its stores made it through the storm with minor damage, though the Kinston location was flooded. Business in other communities has been interrupted, "but things are slowly starting to get back to normal." Jeff Davis is among the lucky ones in Kinston. He's the general manager of Davis Wholesale Tire Co., the business his father Reuben Davis opened in 1955. Davis Wholesale Tire — which, despite its name, is primarily a retail business — sits only a half mile away from the Neuse River. "But we're high. We're probably the high- est business on this stretch of businesses. We've been through (Hurricane) Floyd, Matthew and Florence and we've never had water get into our building." Still, business has been inter- rupted. Aer the storm hit, flood- waters blocked all routes to the store. Once there was a path to travel, there was no internet or telephone service. "We've had some inconvenience, whereas a lot of people have had total devastation." e damage has inspired plenty of goodwill. TBC Corp. established a hurricane relief fund so its employees could help fellow associates affected by the storm. e company matched those gis and raised almost $25,000. American Tire Distributors Inc. took similar action, and set a goal of raising $10,000 for its associates in the Carolinas. It exceeded that goal in 10 days. 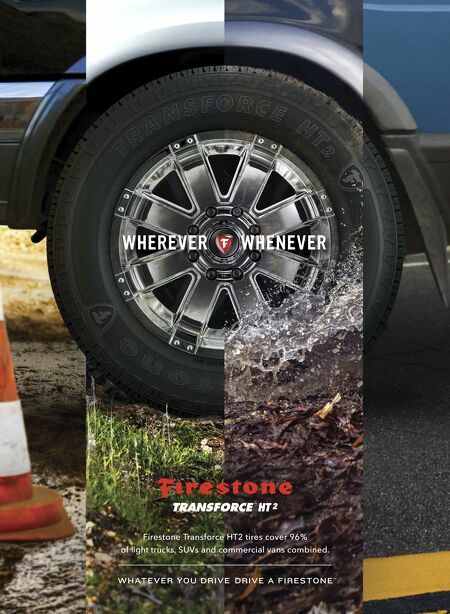 — Joy Kopcha Hurricane recovery is underway NINE BLACK'S TIRE STORES WERE DAMAGED Black's Tire has three stores in Lumberton, N.C. One store on the north side of town had 2 feet of water inside and ap- peared in the Weather Channel's coverage of the storm. "It had never flooded before," says Rick Benton. Flood waters surrounded a Black's Tire store in Lumberton.